Valda Hsu was born and raised in Taiwan. She came to America in 1983 to attend college and study art. After more than four years of rigorous study she graduated from Art Center College of Design with honors. Upon graduation, Valda left Pasadena to work for Hallmark Cards Inc. as an in-house designer. After six years of honorable service, on the eve of her promotion, she quit her job to raise her two children, Chi-ping and Matthew, and become an art teacher. Some of her students loved art so much that they have pursued careers in art. She has taught art for 10 years. 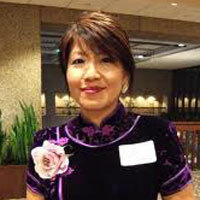 She is also currently involved in teaching the Mandarin Chinese language and culture.